Home / Directors • Fanboying! • Q and A • Throwback Thursday / Throwback Thurs! Holy Collector Madness Batman! Braving The Insanity To Meet Christian Bale! Christopher Nolan! Hans Zimmer! At A Screening Of The Dark Knight Rises! Autographs! With Hostiles about to hit theaters, I thought it was a good time to do a Throwback Thurs about how cool Christian Bale is! I mean, he’s always been nice and this night, well… He was mobbed and still tried to be cool. It was a little insane. Check out the recap below! I wasn’t sure what to expect… But, in retrospect I probably should have expected at least some of the craziness that ensued. Last night there was a q and a for The Dark Knight Rises with star Christian Bale, director Christopher Nolan and composer Hans Zimmer. I knew CB would be drooling over the prospect of getting to meet Christian Bale again and thought Scotty might want to go so here we are. 9:24 p.m. – Scotty and I just arrived and I swear there are like 30 people here… Man, I didn’t expect this! Holy collector’s Batman! 9:26 p.m. – Thankfully, I packed light… I only brought a Dark Knight Rises mini poster that already has Gary Oldman on it and another mini poster from Dark Knight as well. 9:42 p.m. – I think there was a memo passed around about this event. LOL… Come to the Dark Knight Rises and watch a group of thirty people run back and forth in front of the theater! 9:46 p.m. – It’s a car… And… Christopher Nolan is dropping. He gets out of the car and starts to sign autographs. It’s literally chaos. Security is trying to get a line formed but it’s not working. No one is listening and things are being thrown everywhere. Oh my gosh, if I was on the other side of the madness, I don’t know what I would do honestly. Christopher Nolan is nice enough to keep doing it, I just keep missing him. 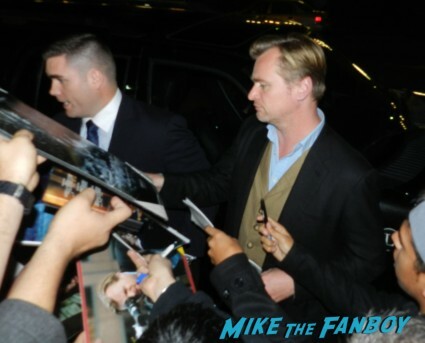 9:47 p.m. – And Christopher Nolan is done and being rushed inside. Doh! 9:48 p.m. – Scotty didn’t need Christopher but CB did get him. 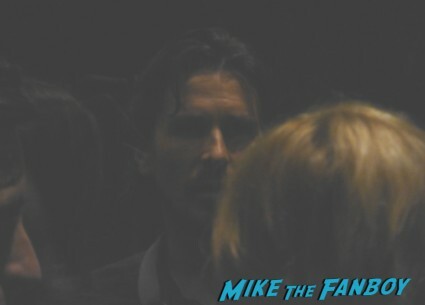 9:51 p.m. – Oh… Oh… There’s Christian Bale… Several calls for a simple line go unheeded. Christian’s arm is in a sling but he’s nice enough to still sign for people. He’s personalizing everything. 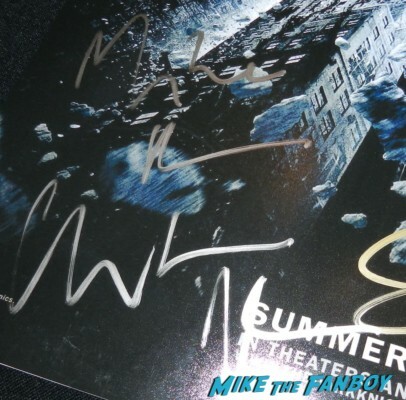 I’m on the side, and while Christian is finishing signing a record, I ask him to sign my mini poster to Mike. He reaches over and honestly he really is taking his time in this madness. I’m a tad surprised. He’s very nice and cordial. After he finishes my poster I get out of the way so Scotty can jump in but it looks like they are getting him inside. Damn… He probably signed about 10 to 15 autographs. 10:09 p.m. – Now the cars are driving around. I’m happy, because my poster looks great and Christian Bale made sure he didn’t sign on top of Gary Oldman which is even more nice. Honestly, if it was me, I don’t think I would have spent as much time as he did. 10:11 p.m. – It’s funny but after events like this, it’s almost like having gone through war and telling stories of what happened. 10:16 p.m. – A man and woman just walked by. 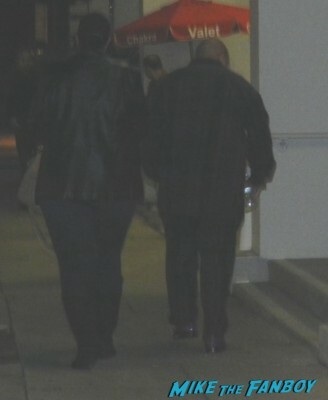 I swear the man had a purple pin stripe suit with matching purple shoes. It was a unique ensemble to say the least. 10:29 p.m. – Oh, people are pouring out… Christian Bale is heading out but his publicist says, “He’s not signing.” I don’t really blame him. 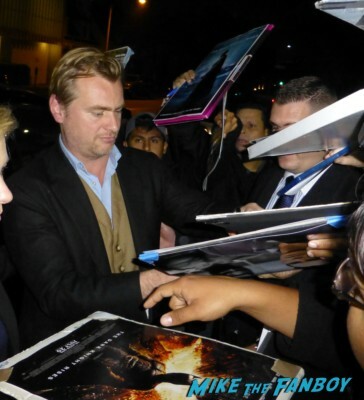 lol… Oh and there’s Christopher Nolan! He darts right on to his car. Hans Zimmer is last and he’s signing a few. 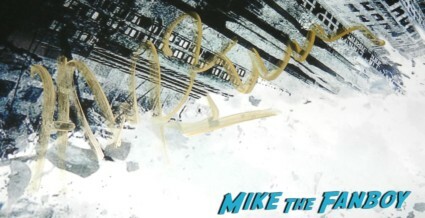 I get up to him and he signs my mini poster really nicely… fast but nice. In fact Hans signs all the way up to his car. 10:34 p.m. – And that as they say is that. Man oh man… I wasn’t expecting such madness… But you know… What can you do right? 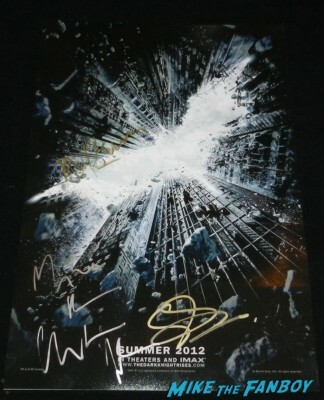 I would have liked Christopher Nolan but anytime you can meet Christian Bale is a pretty awesome night. 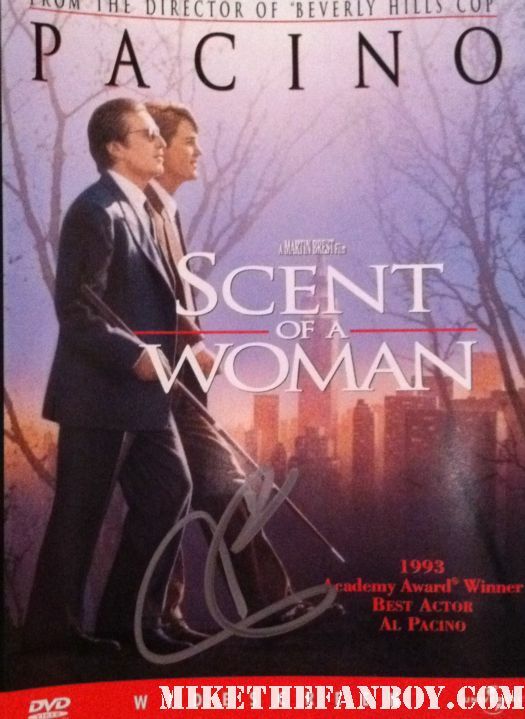 I did find out that no one signed inside at the screening. Wow, it’s usually the opposite. The Railway Man UK Premiere! 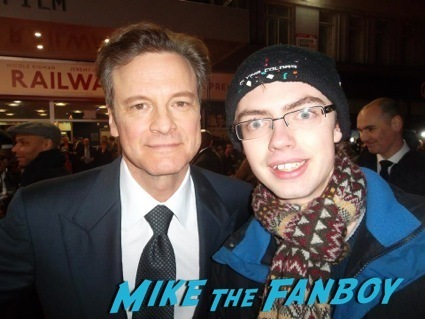 James Meets Colin Firth! Jeremy Irvine! Sam Reid! Autographs! And More! Dawn Of The Planet Of The Apes New York Premiere! Andy Serkis! Gary Oldman! Keri Russell! Billy Says This Is The End After Meeting Emma Watson! Seth Rogen! Paul Rudd! Jay Baruchel! Danny McBride! Awesome Autographs! And More! funny i recognize like 3 of those guys that were camped out in the SD Hilton in the lobby all week and was there when we left hotel and there when we came back…I hope they can make a living with the amount of time they spend there. I think all celebs should personalize as well. Congrats Mike…great job. Cool that you got Bale. As much as I hate personalized autos. (And DKR) It could always be worse.